For those who love HT but don't know how to set up or how to best match to get best sound quality.. HTIB is the best way.. There are good HTIBs, but finding one is a crapshoot. It’s like wandering out into the streets of a strange maze-like city, selecting a restaurant at random, and hoping for the best. Much like any consumer, that’s the position I placed myself in when I reviewed the Yamaha YHT-591 All-in-One Digital Home Theater System, as the box refers to it. Feeling slightly guilty that I don’t review enough HTIBs, I arbitrarily picked this one and served as your surrogate. Here’s what I found.. The One-Box Solution The YHT-591 comes in a single large carton. It includes five slim speakers, a subwoofer, and the HTR-6240 A/V receiver. The AVR comes from Yamaha’s relatively unsung value line, where it sells separately for $380. In most HTIBs, the speakers and AVR are designed to go with each other exclusively. Since you can purchase the AVR alone, presumably that’s not the case here. Yamaha says that more intrepid users can experiment with different speakers as long as they have a minimum impedance of no less than 6 ohms and power handling of up to 105 watts. You can adjust the minimum impedance in an advanced setup menu for either 8 ohms (the default setting) or 6 ohms (which Yamaha recommends for other speakers). With a footprint of less than 4 by 5 inches, the speakers won’t overwhelm your living space with bulk. Somewhere in the Far East, a manufacturer of 2.25-inch paper-coned woofers is very happy. The front speakers use four each, and the surrounds use two each. Yamaha wisely invested in a 0.75-inch silk-dome tweeter for all five speakers. As I later discovered, this system has a smoothness that’s surprising in an HTIB with a three-figure price tag. The enclosures are made of good, solid, vinyl-clad fiberboard, so cabinet resonance is likely to be minimal compared with similarly priced products with plastic enclosures. The speakers include keyholes for a quick-and-dirty mounting job and threaded inserts for something fancier (Yamaha doesn’t include wall-mount hardware). For freestanding use, the horizontal center comes with two rubber pieces that serve as a cradle. The left and right satellites include a 7-inch base, which reconciles its tiny footprint with its 17-inch height. A plastic piece that’s slightly smaller than the speaker enclosure’s footprint fits between the speaker and the base. This gives the whole thing a floating appearance when it’s assembled. Even when assembled, the satellites aren’t tall enough for floorstanding use, but they would fit nicely on a long knee-high cabinet, presumably surrounding a flat-panel TV. There’s nothing comparable for the surrounds. Presumably, Yamaha believes you’re more likely to hang them. The subwoofer has a 10-inch driver on the front and, interestingly, a port on the right side. I don’t recall seeing this kind of asymmetrical side-ported sub before (perhaps I should get out more). If you place the sub along your theater room’s side wall, as some experts recommend, be certain that the port has sufficient clearance. Given the smallness of the woofers in the other speakers—just 2.25 inches, which means the bass extension is likely to be quite limited—I placed the sub below the center speaker, where it could operate to a somewhat higher frequency and fill in the lower part of male voices and other upper bass effects. The sub has a volume knob and high-cut switch on its back panel. The latter serves as the only crossover control on the sub itself—it doesn’t have any other crossover or phase controls. The high-cut has two positions, and the sub’s manual charts their rolloff. One reduces sub output above 70 hertz, while the other reduces it above 100 Hz. Yamaha recommends the bottom position for “optimum tone balance,” but it allows the higher one to let the sub deliver higher bass when the limited extension of smaller satellites demands it. 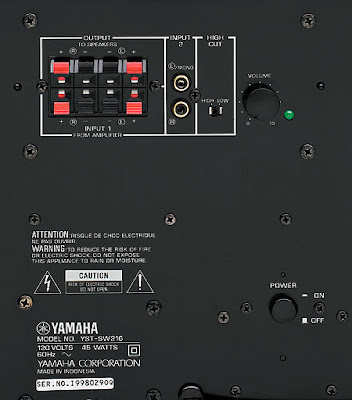 Yamaha made an interesting ergonomic choice with the HTR-6240 A/V receiver’s front panel. To select your source, you must use the two small buttons toward the bottom. The four larger Scene buttons above them select frequently used inputs and associated soundfield options. Connectivity options are minimal, but they’re shrewdly chosen for the most part. They include four HDMI inputs and one output, and the receiver decodes lossless surround (Dolby TrueHD and DTS-HD Master Audio) from native bitstreams. The HDMI version is 1.3c, which is functionally equivalent to the more common 1.3a standard. Component inputs accommodate two additional HD sources, with another output. S-video is absent, but it’s not sorely missed. Composite video supports up to five legacy sources, which should be sufficient for most users. It also includes an iPod docking jack on the back and a headphone input and stereo mini jack on the front. Although the receiver has five amp channels, it supports 7.1-channel surround decoding, and it includes a line output for the back-surrounds. It might be easier to just buy the step-up model YHT-791, which has seven amp channels and associated speakers. However, I don’t think back-surrounds are worth the extra two hundred bucks, unless you’ve got a huge room, and in that case, you shouldn’t be buying an HTIB. Many HTIBs come with precut cables that are often color-coded to match the speaker terminals. This one comes with a single length of skinny wire. When I divided it up, I found I had enough for the surrounds (about 25 feet each) and for one of the front speakers. Other cables in my collection filled the gap. Even for a small room, the supplied cable isn’t sufficient to do the job, and at 24-gauge, it’s pretty flimsy. But don’t regard this as a deal breaker. If you buy the system, plan to invest in a couple of rolls of cheap generic speaker cable. A 50-foot roll of 16-gauge goes for about 10 bucks on Amazon. Don’t worry, anyone can cut and skin wire with a cheap tool from the hardware store.